One of BRI’s greatest research treasures is the BRI Immune Mediated Diseases Biorepository. A biorepository collects, processes, stores and distributes biospecimens to support scientific research. BRI scientists use the donated biologic samples to study the causes of autoimmune and immune-mediated diseases. They research ways to prevent, diagnose, treat and cure many types of diseases. More than 6300 samples are used by BRI scientists each year. 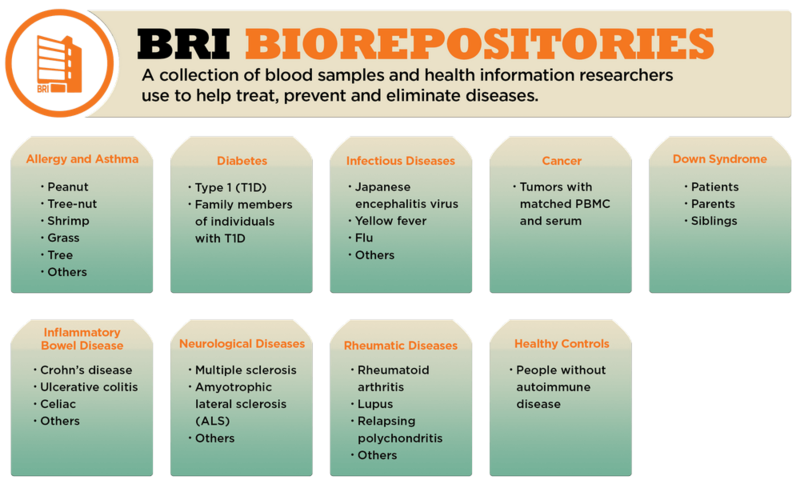 More than 12,000 participants have donated over 250,000 samples of blood and tissue, as well as medical histories to BRI's Biorepositories, since 2000. What are BRI's scientists studying? Using samples donated by people with and without autoimmune and immune system diseases, researchers are able to compare similarities and differences at the cellular and genetic level. They can identify biomarkers with distinct cell characteristics that are associated with the progression of disease. Using these biomarkers, BRI scientists are able to advance their understanding of how and why these diseases develop, identify how genetic risk factors influence the immune system to cause disease and develop targets for new therapies. How does a biorepository work? The biorepositories are confidential lists of people with or without diseases, who are willing to donate a blood or other biologic sample and provide health information for scientific research. All of the information gathered is kept confidential, and samples and health information used by scientists are coded with numbers, not names. Which diseases does BRI focus on? Who can participate in a biorepository? People who have one of the diseases listed above may be eligible to join one of the disease biorepositories. Or if you do not have an autoimmune disease and are in good health, you may be eligible to join the Healthy Controls Biorepository. How can I join a biorepository? To learn more about joining BRI’s biorepository or to schedule an appointment email biorepository@BenaroyaResearch.org. People can also help by encouraging friends and family members with or without these diseases to donate to the biorepository as well. How else can I support BRI? BRI needs community support to continue its crucial work of finding the causes and cures to eliminate autoimmune and immune diseases. For more information about supporting BRI call 206-583-6083 or visit BenaroyaResearch.org/support-us.